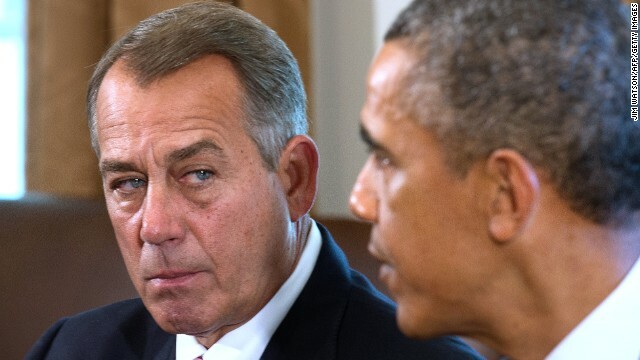 (CNN) – President Barack Obama called House Speaker John Boehner's plans to file a lawsuit over the President's use of executive action "a stunt," in an interview with ABC News Chief Anchor George Stephanopoulos. "You notice that he didn't specifically say what exactly he was objecting to. I'm not going to apologize for trying to do something while they're doing nothing," the President said. "You know, the suit is a stunt. But what I've told Speaker Boehner directly is, 'If you're really concerned about me taking too many executive actions, why don't you try getting something done through Congress?'" The interview aired on ABC's "Good Morning America" Friday morning. It was conducted Thursday during the President's trip to Minneapolis, where Obama held a town hall meeting. The President touted the accomplishments of his first five years in office but lamented the tone in Washington. "What I do worry about is that right now we've got a Republican Party that seems to only care about saying no to me." Obama said. He repeated his frustrations about the immigration reform bill passed a year ago by the Senate that's been stalled in the House, and having to use executive action. "The majority of American people want to see immigration reform done. We had a bipartisan bill through the Senate, and you're going to squawk if I try to fix some parts of it administratively that are within my authority while you are not doing anything?'" the President added. Responding to Obama's comments, Boehner spokesman Michael Steel said Friday in a statement that "the American people, their elected representatives, and the Supreme Court have all expressed serious concerns about the President's failure to follow the Constitution. Dismissing them with words like, 'smidgen' or 'stunt' only reinforces their frustration." Republicans argue that the President is breaching his constitutional power by side-stepping the legislative process. Obama has used executive actions as a way to bypass a deeply divided Congress, avoiding inaction on issues the White House has made hallmarks of the President's second term agenda. So far, the Republican-controlled House has passed two bills aimed at curbing executive orders by the President, neither of which have gone anywhere in the Democratic-controlled Senate. At this point in his presidency, Obama has issued less executive orders than his most recent two-term predecessors in the White House, George W. Bush, Bill Clinton, and Ronald Reagan. In speaking of immigration during the interview, the President was asked about the thousands of unaccompanied children from Central America coming across the southern border. He implored their parents to not send their kids. "Our message absolutely is, 'Don't send your children unaccompanied on trains on through a bunch of smugglers.' That is our direct message to the families in Central America. 'Do not send your children to the borders. If they do make it, they'll get sent back. More importantly, they may not make it'," he said. Lolo- PLEASE don't confuse me, Sonny CHAPMAN, with that Brave Patriot that calls himself Sony Crapman. What is this President suppose to do. Just sit around and wait for congress?? The Republicans have shown time and time again they will do what ever it takes, not to let Obama govern this country. This is a joke, and more of the tax payer's money squandered by Congress they need to do their job. I don't under stand why anyone would vote for these Republicans. These Republican's are a danger to this country and every citizen. They have done nothing by reek havoc and discourse. Why isn't Lynda chastising Sniffit for bulking me in with MILLIONS of republicans (when I am so clearly disgusted with repubs) as she gets so angry with me when I say that all of the gang thinks the same (which they do and there isn't one issue that they don't all agree on)? 1. I really don't get angry with anyone on the ticker, certainly not you. Your comments speak for themselves. 2. Your "gang" talk? It's childish. 3. Your willingness to think for me is fine. Just don't expect me to agree with you that "your thoughts" are "my thoughts". 4. Carry on with your tantrum. Or changing rule 59, to ensure a government shut down. I think suing is a good thing. Keeps everyone on their toes. It won't get past the first writ but it's good theater. Once the Senate goes back to the Republicans in November we shall see the true Obama on display. 200 laws will hit his desk (all being held up by Reid) and he will veto all of them.......nothing will get done and he will be shown to be the fraud he is. Or their primary process, dude, I could do this literally all day. It is a "stunt" that he will not like, if the Supreme Court takes up the case, and rules in Boehner's favor. It is a stunt definitely. The Orange Man couldn't even illicit one thing that he would sue over. Not one. No other president also had to deal with a party using a loophole to keep congress in session strictly to stop the president from appointing people either. No We Wont or Why Should We ? You have seen us lead in congress , now see us lead the world ? this format is crap. bring discus here Oh yeah, Obama is a liar most of the time. The Republicans have shown time and again that they care not about getting something positive done, so long as they can obstruct President Obama and distract him from his job. Boehner is one of the worst. His lawsuit is indeed a stunt. The weeper of the House is an abysmal failure and a fraud. Sorry Lynda, I'm not trying to pick a fight with you but it is frustrating when you take me to task for something and then a person that you agree with does the same thing, only worse, and you will remain silent. Here's the deal, tom. Sniffit doesn't go around trying to corner me by suggesting he knows what I'm thinking, how I voted, or why I vote ... let alone what my personal thoughts are about (A), (B), (C). You do. Which is my beef with you, not Sniffit. You've got a problem with Sniffit, take it to Sniffit. Stop crabbing at me for what Sniffit does. There are very clear broken working relationships here. As a young professional, I have encountered people I diasgree with and don't get along with. The difference – I take leadership to mend damaged fences and build operable relationships with them anyways. The President – who should be setting the tone for all of Washington – has thrown his hands in the air and pointed fingers rather than take that leadership. I don't care how partisan Congress is or how "vindictive" he feels Congressional Republicans may be. President Clinton was faced with a similarly polarized Congress – the big difference – he led. We don't need "immigration reform." We need to enforce the laws which already exist! Obama got everything he wanted, no jobs, obamacare,illegals coming in in , unfettered welfare etc.,etc.,etc!!! The rinos didn't do anything to stop him & now when a rino finally tries to stop him, Obama gets on his high horse & tries to lie again to the American people!!! He said, about obamacare, if the repubs have a better plan, give it to him & they did(any conservative plan is better than a lib plan), & he had Reid shove it under his desk! He said if we had a better jobs plan & we did, (200 bills) & he had Ried shove them under his desk! And now you all want to believe a proven liar about how the repubs stopped him at every turn? That is such a laugh!! You are so gullible!! why don't you just admit,obama is a failure, except what he has done to hurt this country! That's why Rush said he hoped he'd fail in what he was trying to do to the country. Who is it that refused to wear the flag lapel pins after 9/11??!! the unpatriotic left. They haven't loved this country for a long time & Obama was put in office to finally put the last nails in the coffin! To think it took a black lib to bring down the greatest country in the world!!!!! obama is 100% correct about this. You can hate his policies, you can hate him because he is a black man, you can hate him for whatever reason you want – but it takes two to tango. the GOP has countered obama with NOTHING of value to the american public at large – nothing, no immigration plan, no counter-proposals, no negotiation. If the american people are the stockholders and the GOP is the CEO of congress they would have been fired with extreme prejudice for failure to perform the duties of their position – which is to provide us a functioning government. Boehners legacy will be earning america our first ever standard and poors debt rating reduction – so at the end of the day Jihn Boehner has accomplished nothing but screwing up our countries credit score for destablizing the government to the point where financiers think we cant even agree to pay debts that congress itself already approved !